September 7, 2012 Vancouver, Canada -- El Niño Ventures Inc. ("ELN" and the "Company") (TSX.V: ELN; Frankfurt: E7Q; OTCQX: ELNOF) announces the board of directors has approved the repricing of its non-brokered flow-through and non flow-through private placement of up to a combined 33,333,333 units for gross proceeds up to $3,000,000. On August 28, 2012 ELN was provided with the option to earn an additional 15% in the Murray Brook project. Under a purchase agreement signed by Votorantim Metals Canada (VMC) on August 28, 2012 with Murray Brook Minerals (MBM) and Murray Brook Resources Inc. (collectively the owners), VMC acquired the right to purchase the owners remaining 30% of the Murray Brook Project. In the event that ELN elects to earn in on the option from VMC and the owners to earn an additional 15% in the project, this would result in ELN having a combined total of 50% (35% +15%) in the Murray Brook Project. Each non flow-through unit ("NFT Unit") has been re-priced to $0.09 per NFT Unit which will consist of one common share and one-half of one non-transferable share purchase warrant ("Warrant"). Each whole Warrant will entitle the holder to purchase one common share of the Company at a price of $0.15 per share for 18 months from closing, subject to an accelerated expiry, such expiry being accelerated to 30 days in the event the Company's shares have closed at or above a price of $0.25 per share for 10 consecutive trading days on the TSX Venture Exchange. Each flow-through unit ("FT Unit") will consist of one common flow-through share in the capital of the Company and one-half of one non flow-through, non-transferable share purchase warrant has been re-priced to $0.10 per FT Unit. Each whole warrant will entitle the holder thereof to purchase one additional non flow-through common share of the Company at $0.16 for a period of 18 months from closing, subject to an accelerated expiry, such expiry being accelerated to 30 days in the event the Company's shares have closed at or above a price of $0.26 per share for 10 consecutive trading days on the TSX Venture Exchange. The amended private placement terms and any finders fees payable are subject to regulatory approval. 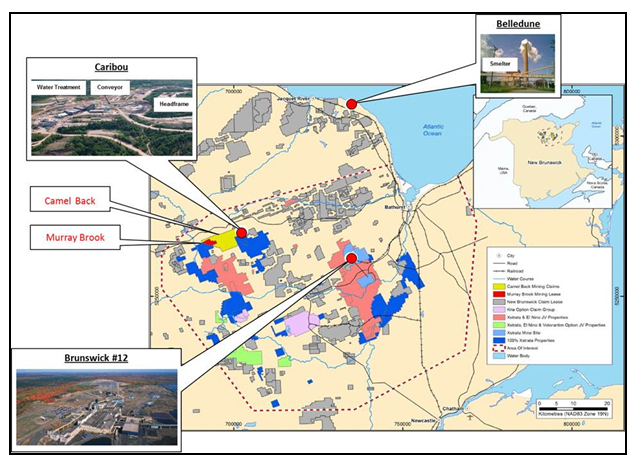 The proceeds of this private placement will be used to fund the Murray Brook polymetallic project in Bathurst, New Brunswick and for general working capital. El Niño Ventures Inc. is an international exploration company, focused on exploring for zinc, copper, silver, gold and lead in New Brunswick, Canada and copper in the Democratic Republic of Congo ("DRC"). The Murray Brook Project is historically the 5th largest massive sulfide deposit in the Bathurst Mining Camp and has excellent infrastructure. Murray Brook Minerals Inc. ("MBM") has been given formal notice by both ELN and Votorantim Metals Canada Inc. ("VMC") and MBM has acknowledged that VMC and ELN have now earned a 70% interest in the Murray Brook polymetallic project, of which 35% is held equally by each of the two parties. Under a purchase agreement signed by VMC on August 28, 2012 with MBM and Murray Brook Resources Inc. (collectively the owners), VMC acquired the right to purchase the additional 30% of the Murray Brook Project from the owners. ELN was provided the option to earn an additional 15% in the project for a combined total of 50% (35% + 15%). (See press release dated Sept 6, 2012). The Management of ELN is currently evaluating the proposal of this option and the terms of the Purchase Agreement. During 2011 and 2012, ELN and VMC completed more than 28,000 metres of drilling with encouraging results. The 2012 drill program was completed in June. A recently completed (February 2012) NI 43-101 Mineral Resource Estimate for the Murray Brook Zn-Cu-Ag-Au-Pb deposit, which includes explanatory footnotes, is presented below. The resource estimate is based on various assumptions regarding mining methods, processing and metal recoveries, payable metal NSR credits and metal prices. This estimate makes no provision for capital costs to mine the deposit, nor mill the material mined, as resources are not reserves and the reader should not presume economic viability. Metallurgical test-work of bulk sample material from the Murray Brook deposit is currently underway at RPC Laboratories (Fredericton, New Brunswick), under the direction of Votorantim Metals Canada Inc., operators of the Murray Brook Project. Three holes were drilled to provide sample materials for metallurgical tests. The test-work is focused on determining potential metal recoveries based on a recommended metals recovery process flowsheet which, subsequently, will form the basis for a small scale metallurgical pilot plant program. Metallurgical results, along with a revised resource estimate which will incorporate the 2012 drill results, (97 holes) will form the basis of a Preliminary Economic Assessment (PEA or Scoping Study) study to be completed in Q1 2013. The mineral resources in this news release were estimated using the Canadian Institute of Mining, Metallurgy and Petroleum (CIM), CIM Standards on Mineral Resources and Reserves, Definitions and Guidelines prepared by the CIM Standard Committee on Reserve Definitions and adopted by CIM Council. The claim group consists of an approximately 4,712 claims in the Tri-Party Agreement with Xstrata & Votorantim Canada whereby Votorantim Canada may incur exploration expenditures of $10 million over a period of 5 years to earn a 50% interest. Votorantim Canada may further increase its interest to 70% by spending an additional $10 million over 2 years. The 2012 field season is the third year of the program and will include up to 12,000 metres of drilling. This news release has been reviewed and approved for technical content by Ali Hassanalizadeh M.Sc., MBA, P.Geo a qualified Person under the provisions of National Instrument 43-101.